Getting rid of fat, part 17. My free belly fat book talks about the importance of leptin and the easiest way to make this master fat hormone work better for fat loss. 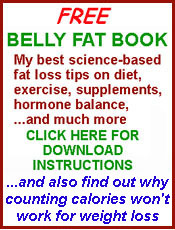 Hi, this is Dr. Dennis Clark again, research scientist, talking to you in my next phase, my next segment, on belly fat science based on the research I’ve done in the medical literature about how to get rid of belly fat. Today I want to talk about the importance of making your hormone, leptin, work for you. As I mentioned in one of my other videos, leptin is called the master fat hormone. When leptin is working for you the right way, there is no way you can gain excess fat or maintain that fat belly. Here’s the most important key for getting your leptin metabolism working for you to metabolize fat the best possible way. What you want to do is get leptin to mobilize fat, or create a signal for mobilizing fat, in between meals for the longest stretch of spacing between meals that you have on a regular basis, and that is between dinner one evening and breakfast the next day. The way hormones work after a meal and the way they cycle, you’ll actually get to a point nine to ten hours after you eat, until you get all the food gone and all the metabolism in the right place between meals except for one thing. At that point, nine to ten hours after you eat is when fat metabolism goes into high gear. If you’re in the habit of eating a late night snack or eating after dinner, or not waiting at least twelve hours between dinner and breakfast the next day, then you are not getting the benefits of enhancing the leptin hormone that’s supposed to work for you in metabolizing fat the way it should. Yes, it’s pretty simple to maximize the effects of your leptin by just changing your eating pattern, taking advantage of the natural balance and cycling of your master fat hormone. You can find out more about how to do this, and what you do to counteract that in your lifestyle by reading my belly fat book, which you can get for free and download at BellyFatScience.com. I hope so see you there.